Hungry? How about some delicious electronics cake? Check that out. Yep, that is an Arduino birthday cakes. We received pictures of this from one of our customers. 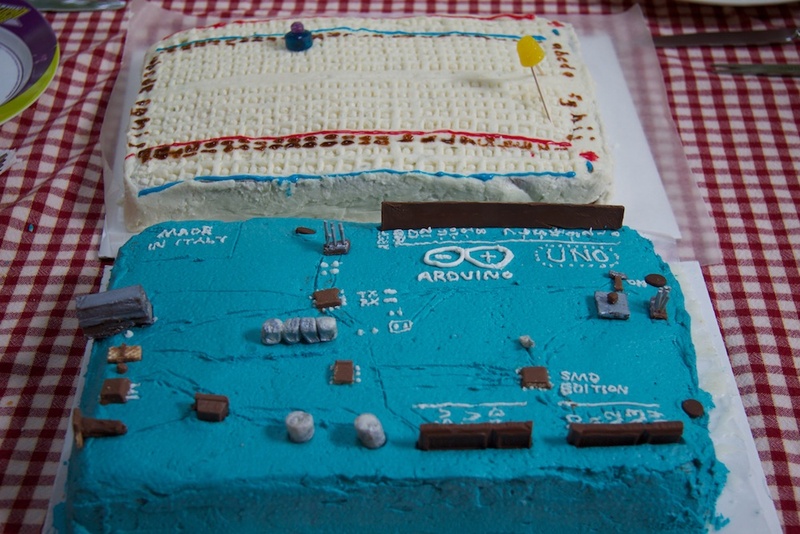 His wife and kids know how much he loves electronics, so they fashioned (quite-well) a cake that is a replica of an Arduino Uno (SMD version) board. Aww Man, only smd edition? Hmm... along with my suggestion of sparking rocks (SparkyFunRocks) I have another idea... ATMega328 SPRINKLES (Like on ice cream!)!!! Mmmmmm. Delicious non-compliant lead solder icing. Alan, you are a very lucky man to not only have a supporting wife and family for your geekdom, but who embrace it to this level as well!! Hang on VERY tight to them! Happy birthday! Good post Davidjh! Everybody comments about the cake, but almost nobody whishes him a happy birthday. I love it! Finally! Will there be a retail (boxed) version of this for sale? Sorry, but we don't allow cake boxes at SparkFun. Hmm I think I have a task for the local bakery around here. Thanks for posting that on my birthday! Makes me want to rig up a microphone & LoL shield for blowing out virtual candles! Awesome... Major kudos for having a breadboard too. Awesome... I wish my sister would do that kind of stuff for me. The edge finishing is accurate, sadly. Also, their headers look straighter than mine. Somebody has way too much time on their hands! Cute though. There's a lot o' love expressed in that cake! All it needs is some licorice connecting the Arduino to the breadboard! Actually, I came home as my daughter was trying to stretch the licorice for jumper wires. But the licorice just wasn't quite long enough. I think a Circus Peanut would be perfect for a resistor. Just paint some color code bars on there with frosting to set the value. And happy birthday to you sir! She wouldn't necessarily burn the LED, if she would connect the LED to pin 13, it would work very very long without burning something. I always wondered how the Arduino team did pin layout. That is AMAZING!! Wow. Huge kudos to whomever made these. 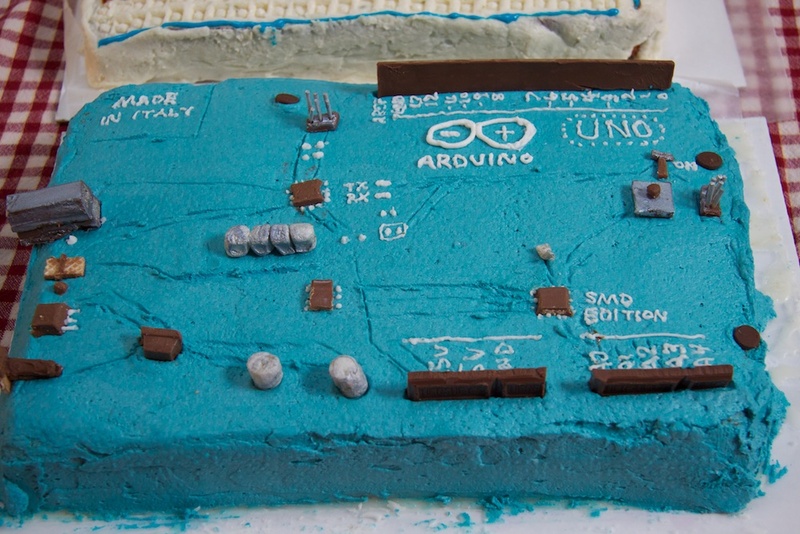 I figure just about everything there is made of icing, but what's the LED sticking out of the breadboard made of? Actually, a lot of the components were made out of chocolate candies and marshmallows. My wife found an edible silver spray paint that she used to get marshmallows and other pieces the right color. Everything except the LED legs (toothpicks) was edible. It looks like it is made from a yellow gumdrop. It would taste horrible(Lots 0' Salt) but they could make it out of squishy circuits and have the LED actually light up. Hey today is my birthday too! What an awesome present! uuuuuu I want one of those! :D looks reaaaally good!! !